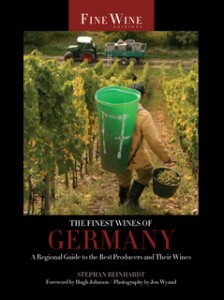 Title of book: The Finest Wines of Germany, a regional guide to the best producers and their wines. For a lover of cool climate wines I’m pre-disposed to want to like this book. Inevitably it’s a book largely about Riesling (though pinot noir features well too), and I like Reinhardt’s ‘cool’ anecdotes to arrive at ‘pins and needles, rocks and minerals” to describe the variety in its Germanic homeland (undoubtedly because it concords with some of my own descriptions). The 15th century marked the identification of riesling’s suitability to steep slope, long season ripening, and by the late 18th century the variety was being distinguished by village and vineyard, as well as by variable sugar levels. Reinhardt takes us logically through the confusing picture of sugar hierarchies, 19th century classifications, the basics of the much criticised 1971 German Wine Law, and the emergence of the VDP. The modern chic for German cool, and the renaissance of Riesling quality, from sweet and sour to cleverly cool, and increasingly dry, Reinhardt charts to the early 1990s, less than a generation ago. His short chapter discussing wine styles, including perceptions of sugar, acidity, alcohol is full of numbers and an amusingly clear (!) analysis of what the wine might taste like – “almost anything is possible” – depending on what the label says. It’s not all about riesling though. As you’d expect, the main grape varieties and their characteristics are outlined. Before launching into regional introductions and the profiles of some 70 producers, Reinhardt explores what is required to make ‘the finest wines’ in Germany, including the small-scale, holistic, family operation where all the jobs from meticulous growing to making to marketing are undertaken and ‘interpreted’ by one or two people, where less is more, and where attention to detail is second nature. I’d have liked more detailed maps (though that could just be me), even just of some of the vineyards of a few of the producers profiled. I didn’t really get a feel for the microscopy of cool climate geographical scale that Reinhardt had discussed in earlier chapters. Mind you, he does cram huge detail into the words – the Fürsts in Franken, for example, compare clone yields and green harvest practices according to vineyard site, as well as cover cropping philosophy. Or the paucity of soils in the vineyards of the Wagner-Stempels in Rheinhessen, where even so the vines are kept “on a diet”. The reader is left in little doubt that the passion of these producers, making the myriad tiny (and big) decisions each year in the vineyard and winery, truly affects the wines they make. Reinhardt writes fluidly and compactly, sharing his own considered thoughts with the reader through example and detail, in a way that’s easy to follow, and well nerdy enough for the serious student of wine.